Nambour is a town and locality in South East Queensland, Australia, 101 kilometres (63 mi) north of the state capital, Brisbane. The town lies in the sub-tropical hinterland of the Sunshine Coast at the foot of the Blackall Range and has a population of 11,187. It was the administrative centre and capital of the Maroochy Shire and is now the administrative centre of the Sunshine Coast Region. The greater Nambour region includes surrounding suburbs such as Burnside, Coes Creek, and Perwillowen, and has an estimated population of 15,550. The name is derived from the Aboriginal word "naamba", referring to the red-flowering bottle brush Callistemon viminalis. In 1862, Tom Petrie with 25 Turrbal and Kabi Kabi men including Ker-Walli, Wanangga and Billy Dinghy entered Petrie's Creek with the view to exploit the large cedar growing in the vicinity. Probably near Rosemount, they encountered some resident aboriginals with whom they had a traditional ceremony together. Petrie's group afterwards made a permanent logging camp further up the creek in the area now known as Nambour. At this camp, Petrie branded the 25 aboriginals that were working for him. With a piece of prepared glass, he cut his logging symbol of a P inside a circle into each of the men's arms. These aboriginals, as well as local Maroochy men such as Puram, worked hard, returning frequently with Petrie to build the roadway, fell the timber and transport the logs downriver. The Nambour area had its first permanent European settlement in 1870. The town was then still just called Petrie's Creek. In 1890 the Maroochy Divisional Board was established. In 1891, the rail link with Brisbane was completed, and at its opening Petrie's Creek was renamed "Nambour", after the Nambour cattle station. A fire in 1924 destroyed many of the timber buildings along the main street. Petrie's Creek Post Office opened on 1 June 1888 (a receiving office had been open from 1885, originally known as Carrollo) and was renamed Nambour by 1890. The Nambour branch of the Queensland Country Women's Association was founded on 1 November 1928. In 1931 they established their QCWA Rest Rooms in the Shire Hall. In September 1958 they officially opened their own building at 10 Short Street (still in use today). The town was bypassed by the Bruce Highway on 16 October 1990, which now forms the locality's north-eastern boundary. This alleviated most of the local traffic congestion. Along the middle of the roadway of Mill, Currie and Howard Streets, a piece of Queensland Rail history is still on display - the Nambour to Coolum Tramline. The Tramline was used to transport passengers and sugar cane in the early 1920s. The Tramline forms part of the Moreton Central Sugar Mill Cane Tramway, The tramway closed at the end of 2001. Much of the track and signal lighting still remains. The Nambour & District Historical Museum, more widely known as the Nambour Museum began with an opening ceremony held on 20 April 1996. The Nambour Public Library opened in 1982 and had a major refurbishment in 1998 with a minor refurbishment in 2016. In the 2011 census, Nambour had a population of 10,221. According to the 2016 census of Population, there were 11,187 people in Nambour. Aboriginal and Torres Strait Islander people made up 4.4% of the population. 77.1% of people were born in Australia. The next most common countries of birth were England 4.0% and New Zealand 3.6%. 87.7% of people spoke only English at home. The most common responses for religion were No Religion 33.5%, Catholic 16.0% and Anglican 13.5%. Nambour's primary industry has been sugar, with extensive cane fields surrounding the town, and the Moreton Central Sugar Mill in the town centre. The mill itself began operating in 1897 until it was closed in 2003. The long-term future of the sugar industry in the area is in doubt. Other industries in the area include tourism, and the growing of tropical fruits. The Big Pineapple tourist attraction on the southern outskirts of the town (closed in October 2010 following its sale) reflects both of these pursuits. 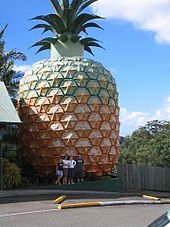 The Big Pineapple Music Festival attracts thousands of visitors to Nambour. Other tourist attractions include Thrill Hill Waterslide Park, the Big Cow, and the Big Macadamia nut. Situated near Nambour is the Queensland Government's Maroochy Research Station which is a major subtropical fruit and nut research and extension centre. The 61 ha research facility was established in 1945, and has an office and laboratory complex, glasshouses, netted orchards, postharvest coolrooms and a biotechnology facility. With access to national and international funding sources, specialist staff often work in conjunction with investigators from other research agencies. The main shopping areas in Nambour are Nambour Plaza which has approximately 40 stores, Nambour Mill Village Shopping Centre and Centenary Square Shopping Centre. The TransLink Transit Authority (known as TransLink) is the authority that coordinates and integrates the public rail and bus services in South-East Queensland, of which Nambour is in Zone 6. Nambour is serviced by several Queensland Rail passenger trains, including the Tilt Train and is approximately one and a half hours north of Brisbane by rail. Regular services depart from Nambour railway station and use the Sunshine Coast line. The region connected to Brisbane via the Bruce Highway which forms part of the M1 motorway. Greyhound Australia interstate coach operators also operate daily bus services to Brisbane using the major corridors. The local bus service is operated by Sunbus Sunshine Coast which has various routes between Nambour and Noosa and the Sunshine Coast, including one via Eumundi. Nambour is also served by Sunshine Coast Airport. The airport is approximately 25 minutes east of Nambour by car. Brisbane Airport is approximately one hour and ten minutes south of Nambour by car. is located on Hospital Road and provides, among other services, diagnostic, surgical, general medical, emergency, intensive care, and aged care services for the Sunshine Coast-Wide Bay Health Service District. Nambour Selangor Private Hospital is located on Netherton Street. Private specialists’ consulting suites and radiology services are co-located within the Hospital campus. The distribution network company that provides electricity to Nambour residents is Energex. On 1 July 2010, Sunshine Coast Regional Council's Water Services (along with Moreton Bay Regional Council), moved over to the recently created water body, Unity Water. Unity Water was created by the Queensland Government as part of the State's takeover of South East Queensland's water facilities, dams and water supply networks. Moreton Bay and Sunshine Coast Regional Councils own 50% of Unity Water. The Nambour Civic Centre is an arts and entertainment venue that includes cinema, music, theatre, dance and other events. The Nambour Lind Lane Theatre is another live theatre venue. Nambour Originals (sibling of Peregian Originals held at Peregian Beach) is an open air community event that involves live music in a picnic style format. It is held at 1pm every 2nd and 4th Sunday of each month at Quota Park Amphitheatre on Matthews Street. The facilities at Quota Park include barbecues, a sheltered area, shady trees, a kids play area, toilets and parking. The Nambour Festival, which began as the Nambour Sugar Festival in the 1980s, has been held at Quota Park since 2008. The festival showcases local musicians, entertainers, cooking demonstrations, local produce, a diverse range of activities for children, and market stalls. The Sunshine Coast Agricultural Show was first held in 1905 in Woombye. The first show in Nambour was held in 1909. Today, the Sunshine Coast Agricultural Show is a modern three-day show full of agricultural, community and entertainment events. The Queensland Home Garden Expo is a three-day gardening event held at the Nambour Showgrounds. Nambour is the fifth town mentioned in the original (Australian) version of the song "I've Been Everywhere". The daily local newspaper is the Sunshine Coast Daily which is published by APN News & Media. There is also a weekly news service provided by the Nambour Weekly which is published on Wednesdays. The Nambour Chronicle was published from 1903 until it ceased publication in the 1980s. Nambour is also in the television broadcast licence areas of Brisbane (metro), enabling most areas of the Sunshine Coast to receive the commercial Brisbane stations. Many community access stations, as well as some Brisbane stations can also be received. The Sunshine Coast Regional Council operates a public library in Nambour at the corner of Bury and Currie Streets. The Nambour branch of the Queensland Country Women's Association meets at 10 Short Street. The Nambour Wildcats Soccer Club is part of the Sunshine Coast Churches Soccer Association and was established in 1976, it is one of the largest sporting clubs in the region with over 350 players from U6 to senior Mens, Ladies and Over 35's. The Nambour Crushers Rugby League Club was established in 1985. The grounds are situated at 22 Crusher Park Drive. The Crushers have teams in all grades from Under 7s to A Grade and number approximately 300 players. The Nambour Rugby Union Club entered the Sunshine Coast District Rugby Union Competition in 1981. The club is known as the "Toads". The club`s ground is situated on Laidlaw Road in nearby Woombye. Nambour fields four "Senior" sides in the Sunshine Coast Competition: A Grade, Reserve Grade and U19`s as well as a women's team. A junior club with teams from under 7s through to under 17s also runs. Nambour were local premiers in 1912 and 1913. The Nambour and Districts Netball Association is made up of clubs from Yandina, Burnside, Nambour, Woombye, Palmwoods and the school based Saints club. Nambour Cricket Club is part of the Sunshine Coast Cricket Association and has played on the Nambour showgrounds since the early 1890s when a Nambour team competed against teams from nearby towns. The Nambour Aquatic Centre is located in Petrie Park and has heated pools all year round. The complex offers a variety of activities including a 50m heated pool, a 25m heated enclosed pool, toddler pools and fountains/play area, a learn to swim program, aqua aerobics classes, and a poolside cafe. Pat Rafter, tennis player made his debut in Nambour. His name has been on the wall of the local tennis club since he won the junior championship as a sixteen-year-old. Kevin Rudd attended Nambour State High School as did Wayne Swan and Queensland Speaker Fiona Simpson. Carolyn Male - member of the Legislative Assembly of Queensland from 2001 to 2012. Max Gaylard, United Nations Assistant Secretary-General currently working as Deputy Special Coordinator for the Middle East Peace Process and United Nations coordinator for humanitarian and development activities in the Occupied Palestinian Territory. Daniel Keighran - awarded Australia's military highest honour, the Victoria Cross for Australia for bravery during the Battle of Derapet in Afghanistan in 2010. Nambour Special School is located on Windsor Drive and is for children aged 5 to 18 years. Sunshine Coast Institute of TAFE has its largest campus in Nambour. ^ a b c Australian Bureau of Statistics (27 June 2017). "Nambour (State Suburb)". 2016 Census QuickStats. Retrieved 29 January 2018. ^ "Nambour (entry 23780)". Queensland Place Names. Queensland Government. Retrieved 17 September 2015. ^ "Nambour (entry 48799)". Queensland Place Names. Queensland Government. Retrieved 17 September 2015. ^ Petrie, C.C. (1904). Tom Petrie's Reminiscences of Early Queensland. Brisbane: Watson, Ferguson & Co. pp. 191–202. ^ a b Environmental Protection Agency (Queensland) (2000). Heritage Trails of the Great South East. State of Queensland. p. 135. ISBN 0-7345-1008-X. ^ "Q.C.W.A. Hall and Rest Rooms, Short Street, Nambour, 1960". 1960. Retrieved 2 January 2019. ^ "Public Libraries Statistical Bulletin 2016-17" (PDF). Public Libraries Connect. November 2017. Archived (PDF) from the original on 30 January 2018. Retrieved 19 January 2018. ^ Australian Bureau of Statistics (31 October 2012). "Nambour (Maroochy Shire) (State Suburb)". 2011 Census QuickStats. Retrieved 17 February 2013. ^ "Nambour Section of the Moreton Central Sugar Mill Cane Tramway (entry 602522)". Queensland Heritage Register. Queensland Heritage Council. Retrieved 14 July 2013. ^ "Moreton Central Sugar Mill Worker's Housing (former) (entry 602648)". Queensland Heritage Register. Queensland Heritage Council. Retrieved 14 July 2013. ^ "Tramway Lift Bridge over Maroochy River (entry 602527)". Queensland Heritage Register. Queensland Heritage Council. Retrieved 14 July 2013. ^ "Nambour Section of the Moreton Central Sugar Mill Cane Tramway (entry 602522)". Queensland Heritage Register. Queensland Heritage Council. Retrieved 1 August 2014. ^ "Big Macadamia" (Travel guide). Travelmate. Archived from the original on 22 July 2008. Retrieved 15 October 2008. ^ "Nambour Library". Public Libraries Connect. 21 August 2015. Archived from the original on 19 January 2018. Retrieved 19 January 2018. ^ Carolyn Tucker (1 December 2007). "High and mighty Nambour". The Daily. Archived from the original on 2 January 2008. Retrieved 8 January 2008. ^ "Climate statistics for Australian locations". Bureau of Meteorology. Archived from the original on 16 March 2011. Retrieved 30 January 2011.